Believe it or not, I've been refinishing furniture since I was about 10. Most weekends you could find me in the garage working on some family heirloom my mom had acquired. It was all good, though, because I really did enjoy it. And now, 27 years later, I can give you a few of my quick tips and things I've learned along the way. You have to sand furniture before you stain. You just do. You may think "oh it will be ok if I don't sand it." It won't. If you don't sand the furniture, the stain will be blotchy. But be careful that you don't over sand. Over sand? Yes, you can over sand. I actually just found this one out recently. I had the wood for my countertops jointed, boarded and planed by the mill. Apparently they decided to run it through the drum sander for me. I hadn't really noticed so when I sanded it on my end, it over sanded the wood. What resulted was some nasty stain adherence (the good news, though, is now I will have a great tutorial to share with you on fixing blotchy wood). I discovered that when you over sand, the wood loses the ability to take the stain. Softwoods are the easiest to over sand. On projects using soft wood, I use a 120 grit sandpaper and sand just enough to remove loose fibers. I've found this results in a more even stain. Hardwoods are great, but they also can be over sanded. For these, I use a 100 grit sandpaper and, again, just sand enough to remove loose fibers. You will read all kinds of articles that tell you to go from several low grits to higher and higher grit. I don't do that (not that it's wrong, it's just not what I do). It took years to figure out that was the trick to getting the stain to go on evenly. Also, always remember to sand with the grain. If you go against the grain, it will scratch the wood. I actually did it on accident a few weeks ago and wanted to kick myself (how do you accidentally sand against the grain? Kids). You can fix a cross-grain scratch, but it can quickly and easily lead to over sanding. Up until recently, I didn't use wood conditioner. I never really saw the benefit. After the horrible stain job on the countertops, I was convinced to give it a try so I did. The results were amazing. Since wood conditioner opens the grain of the wood, the stain absorbs better and more evenly (so instead of several coats of stain, you can use one or two). It's one extra step that can save you from having to do multiple coats of stain. Sounds like a no-brainer, but if you use low quality stain, you will achieve low-quality results. There is one big brand I just flat out don't use. Until I do. And then I kick myself for using it again. A few days ago I used Sherwin Williams Wood Classics and wow. Just wow. I've never had a stain go on so well and dry so incredibly fast. I'm definitely a fan. Just like with anything, the right tools make all the difference. Depending on the wood, I use different methods for application. 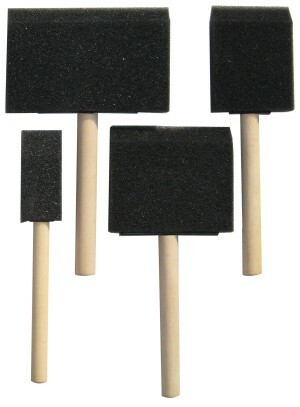 For pine and softwoods, I use the foam paint brushes. I soak the foam paint brush in the stain and apply a layer to the entire surface. I immediately go behind it with another dry foam paint brush. Most stain brands will tell you to let stain sit longer to get a darker color. I don't do that. I always immediately wipe it off. If I want it darker, I wait 30 minutes and add another coat. I only do this on softwoods. For hardwoods, I use rags. I dip the rag in the stain and apply the stain to the entire surface. I let the stain sit for 15 or 20 minutes and remove the excess with a clean rag. A note here: Some stains will not allow you let the stain sit for this long. I suggest reading the label to see what the maximum amount of time they recommend is. If it's less than 15 minutes, I would use a different stain. You need a stain that lets you "work" with it. Staining is a process. I wait 24 hours between coats. Yes, it takes longer, but if you want great results it's worth the wait. I always sand the furniture with a 320 grit sandpaper in between coats and before I add poly. It's more of a light sweeping than a sanding - basically just enough to roughen it up a bit. If you want to keep your finish looking flawless, you have to poly. 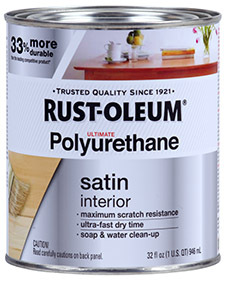 For this, I recommend Rustoleum. I've used it for years and have always loved the way it finishes. So that's it in a nutshell. Hopefully some of these tips will help you in your projects. If you have any tips, please comment below so we can share them! Note: All of the products listed are my preferences. I have not been asked to suggest products by any manufacturers. Aw... thanks for signing up! Each Friday you will receive an email with the latest and the greatest from The Rozy Home. And if you ever get tired of getting emails, it's super easy to unsubscribe because, lets face it, nothing is worse than getting a newsletter that is a pain to unsubscribe from!